Kate Lynch is holding a two-man show along with James Meiklejohn entitled ‘Changing Seasons’ at The Jerram Gallery, Half Moon Street, Sherborne, Dorset from Saturday 13 April to Wednesday 1 May 2019. There are 40 paintings in the exhibition with prices ranging from £600 – £3,000. Over the last 18 years Kate Lynch has emerged as one of the most remarkable and original painters documenting the working lives of rural craftsmen and women and the people who farm the land. She has carved herself an enviable reputation for her journeys with Somerset’s willow growers and basketmakers, shepherds, beekeepers and farmers painting them at work. She lives with her husband, painter James Lynch on the Somerset Levels. Kate Lynch - Rob with the lambs and their mother, 25 x 19cm, oil on paper. 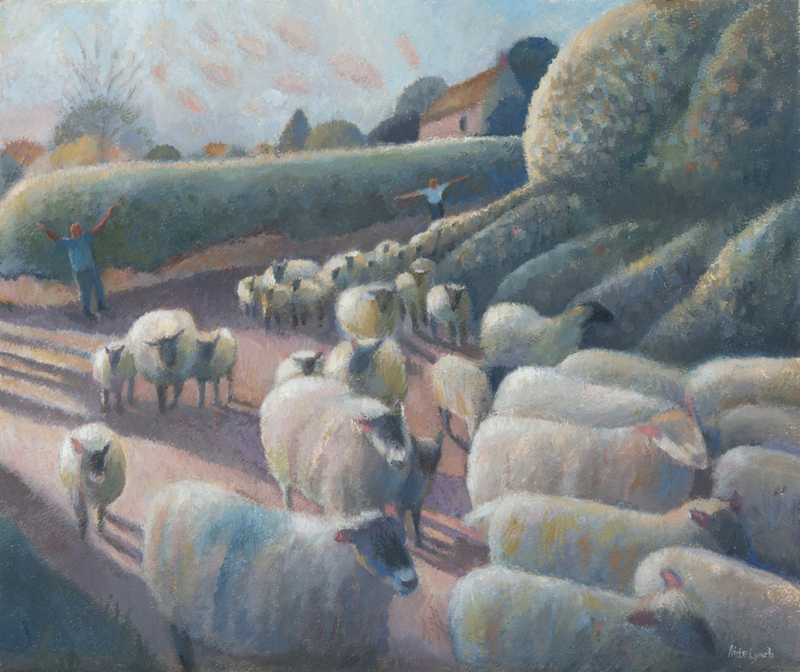 Kate Lynch - Running the ewes and lambs to the farm, 35 x 42cm, oil on paper. Somerset farms offer a rich and varied seam of visual imagery, from the running of the ewes and lambs through Somerset lanes to the lambing sheds. 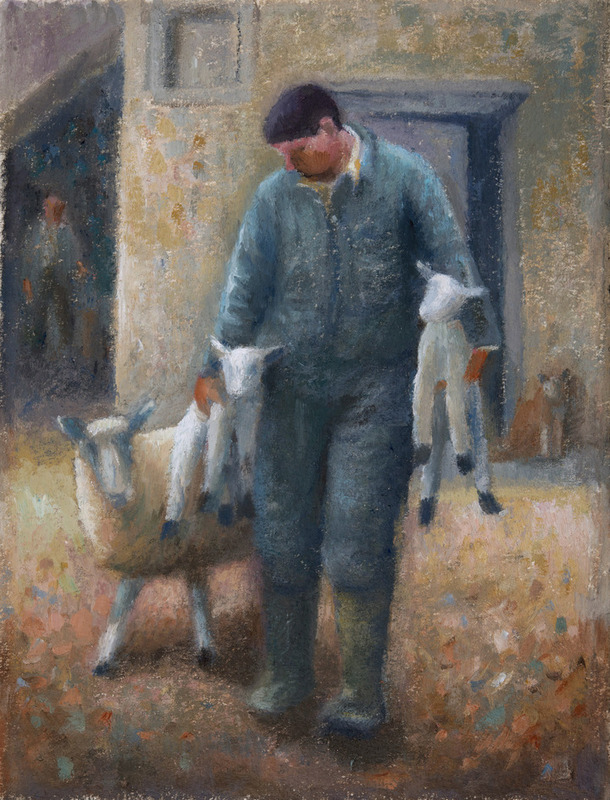 Four of the paintings in the show portray life on the Hassed farm where the farmer, who is helped by his wife and grand-daughter, looks after a small flock of fine Poll Dorset sheep. Cidermaking is everywhere in Somerset and the exhibition focuses on blossom time and apple picking in Pam Johnson’s orchard. She has also captured life at Bennett’s farm, a very old cider farm, where cider is made for their own consumption and is not part of the modern rebirth of cidermaking. 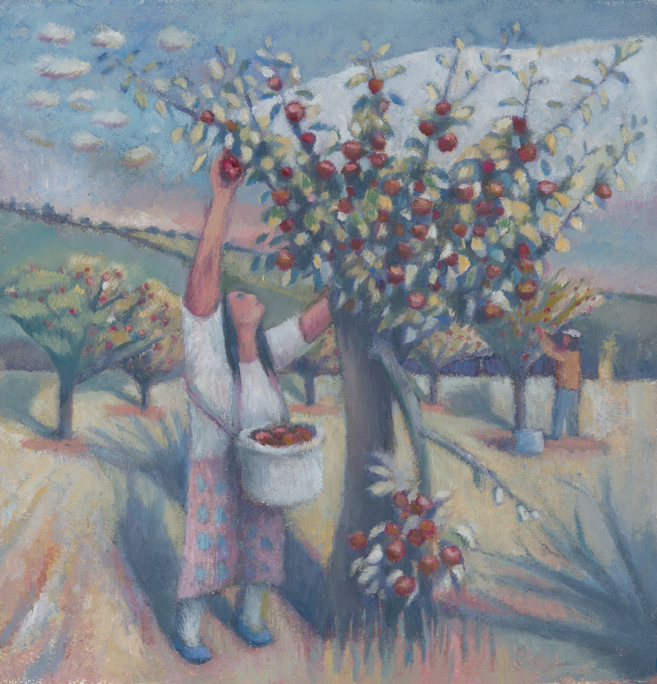 Kate Lynch - Apple picking, 33 x 31cm, oil on paper. Her paintings are very often portraits and although they are not facial likenesses, the figures and barely-defined faces are recognisable and people often say they recognise the person just by the way they are standing. She enjoys catching the individual stance, tilt, characteristic hunch of the shoulders, shadows defining the particular form, describing the individuality of someone with moderated tone and shape. James Meiklejohn - Summer Hare, Seasons of the Hare, 20 x 40 inches, oil on linen canvas. The theme moves onto gardening where she captures fascinating images of Queenie and her husband Ken. They are both aged 90 and Queenie grows dahlias and Ken grows the vegetables. They married late and hold hands. 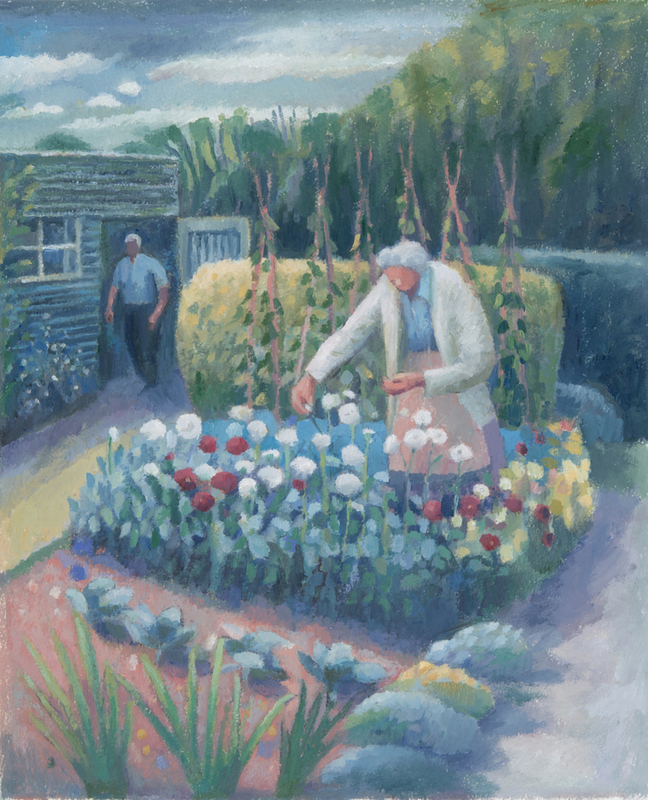 The show includes a magical painting of Queenie dead-heading her dahlias with Ken in the background. Continuing with the gardening theme, there is a painting of Duncan, a Day Lily aficionado amongst his sculpted topiary pillars and garden ‘rooms’. Kate Lynch - Queenie dead-heading dahlias, 38 x 31cm, oil on paper. Born in 1949, Kate Lynch has a BA Hons degree in the History of Art, Post-Graduate Certificate in Education and Art Teacher’s Diploma, and a Diploma in Post-Graduate Fine Art Studies. “I paint farmers at work in Wessex, mostly Somerset, also recording conversations with them. I’m interested in the history on our doorstep, the changes people have witnessed in living memory, rural traditions, the timelessness of some rural work, recording it in sketches, paintings and large drawings, and collecting stories”. She has exhibited widely in the West Country and her themed exhibitions have toured to other parts of the country. Several of her paintings are in Somerset Heritage Services permanent collection. James Meiklejohn, born in 1962, is based near Shaftesbury in Dorset. James is inspired by the history of Hambledon Hill, an Iron Age fort situated in the Blackmore Vale, five miles northwest of Blandford Forum, on the southwestern corner of Cranborne Chase. He takes this as a starting point in many of his landscape pictures which nearly always include animals and birds in the context of the hill. He is a great advocate of working mainly from life to keep his paintings authentic and heartfelt and says, “the best work is somewhere between what is directly observed and imagination”. He has exhibited his work in galleries throughout the UK and Europe and his portraits have been exhibited in the BP Portrait Award t the National Portrait Gallery and at the Royal Society of Portrait Painters. His paintings are held in various collections including the Royal Bank of Scotland and Longleat House.